The Archive has nearly 3,000 books pertaining to the history of Larimer County and Colorado. Many of these books are rare and out of print, and include yearbooks, city reports, and volumes on architectural history. These books may only be used on-site at the Archive. 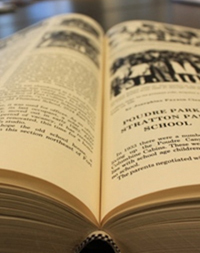 Though the Local History Archive books are non-circulating, additional copies of several Archive books can be found and checked out at the Poudre River Public Library District. To find out if a book is also at the Library, click on the link listed by "Library Availability" within each book's record in the Archive database. You can also visit the library and search the Library's online catalog.